This platinum solitaire engagement ring was made in Nov. 2014. 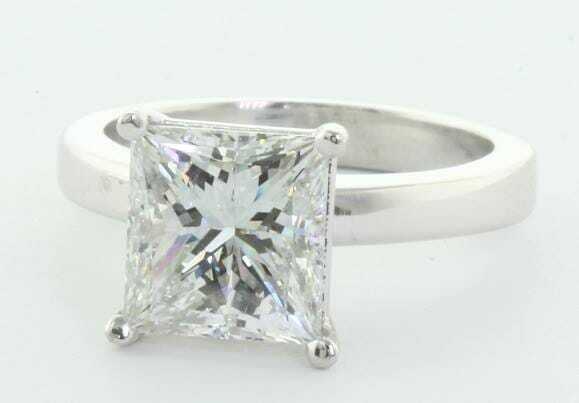 The ring was custom made to fit the large 3.26 carat princess cut diamond. This specific diamond is certified by GIA and classify as F colour and SI1 clarity. The inclusions on this diamonds are white in colour and are very little - most jewellers and diamond expert will classify this diamond as VS2 clarity. In terms of cut, this diamond is as good as it gets - the diamond has a lot of brilliance and fire and sometimes make it hard to look at in day light. The actual ring setting was made to sit nicely next to a matching wedding ring. We used Platinum to make the ring. If you would like some more information about this ring or similar ring please feel free to contact us on 1300 361 873 or via the contact us page.